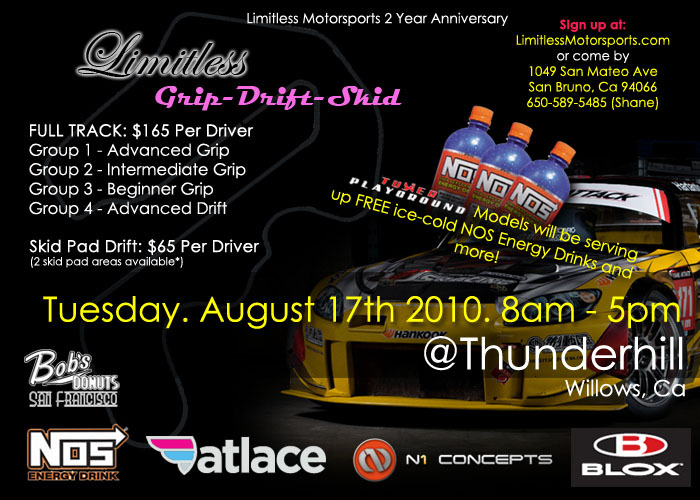 Home EVENTS	Limitless Motorsports: Grip. Drift. Skid. Enjoy a chance to experience the sweet corners of Northern California’s best grassroots racetrack and help us celebrate 2 years of Limitless Motorsports!! There will be plenty of tracktime, fun times, and photos! Space is limited to 15 drivers per run group. We will have 4 run groups for maximum fun! Novice, Intermediate, Advanced grip, and Advanced drift! Contact Shane @ 650.589.5485 for signups and more information. Advanced Drifters! This is one of the few great opportunities this year to drift Thunderhill. We will have a few special things going on inspired by some previous great track events. Full track drift will be ADVANCED only. No off-tracks, losing body parts, dirt dropping. The grippers and the track hates that kind of stuff, plus it wastes runtime for everybody. Skidpad Drifters! Skidpad price will be $65. If we get more than 20 skidpad drifters, we will open up a 2nd skidpad. Then your skidpad pass will let you run on both North and South paddock skidpads. Gates open at 7:00 AM. Everybody must be at the meeting. No meeting no tracktime. Wristbands will be handed out at the end of the meeting, when we get back the tech sheets. Cars on track at 9:00 AM. There will also be a RC track set up for some additional drifting action. so feel free to bring out your RC. Signed up for skidpad! so excited! i heard there are still spots left!! !